I had to smile when I saw this cartoon that George Couros (@gcouros) tweeted recently. It also got me thinking about making sure I listen with greater intent when students share a rationale with me as to why an assignment was not completed. I think I have been guilty of dismissing the response before it was even fully shared with me and as I reflect on that, I think I missed an opportunity for a deeper connection and deeper understanding of why kids don’t always get their work done. As the school year gets underway, we should all commit to asking the next layer of questions in an effort to get to the real challenges that impede a student’s ability to complete all that is asked of them. Sometimes bravado is much easier to demonstrate (and more face-saving in front of their peers) than confusion. Looking beyond that moment may be the start of a stronger relationship developing. 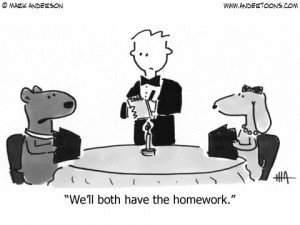 While, “the dog ate my homework”, may be a stretch to consistently believe as a rationale, perhaps it should not be as easy to dismiss offhand as I once believed. The cartoon is a subtle reminder that there is much more than the surface story and in digging deeper we may find something that turns students on rather than off.